Skater Sonja Henie 'Put A Dollar Sign' Behind The Gold : The Edge The Norwegian figure skater reinvented the sport, adding grace and lyricism while also helping to commercialize it. She translated her gold medals into a high-flying Hollywood career, but also sparked controversy by rubbing shoulders with Adolf Hitler himself. 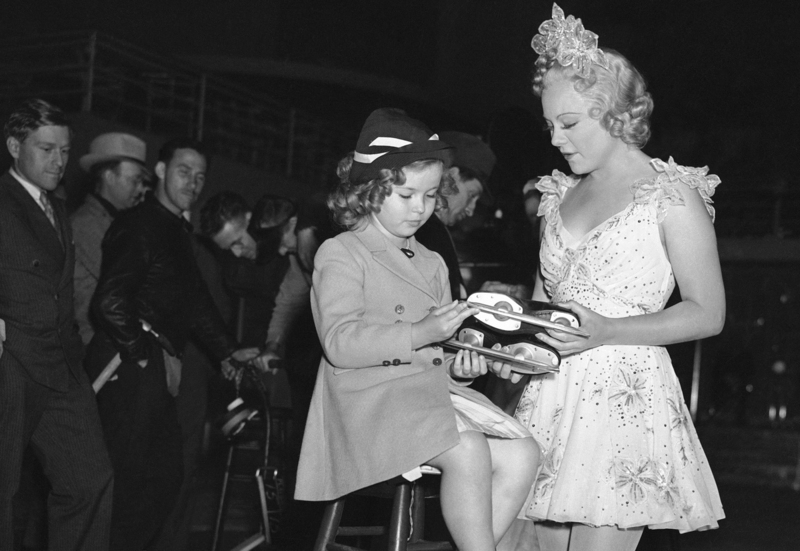 Skater Sonja Henie (right) presents Shirley Temple with a pair of skates. When you see those graceful figure skaters perform at the Winter Games in Sochi — with their athleticism and their big-money endorsement deals — for better or worse, Sonja Henie paved the way. Henie was the world's first great figure skater. A huge star in the 1930s and '40s, she was also divisive and controversial. She grew up in Norway and was a dominant presence on the ice for decades, her grace and lyricism captured in newsreels and later in 11 Hollywood films. She competed in the very first Winter Games held in 1924. At just 12 years old, she got clobbered. But by 1932, when she traveled to Lake Placid, N.Y., Henie was already an international star — and already raising eyebrows. In an age that celebrated amateur athletics, especially among young women, she was happy to receive gifts and cushy treatment from wealthy admirers. "This is a good opportunity for me to send my [greetings] to my American public and also thank them for a beautiful car!" she said posing next a shiny new automobile. Henie did a couple of things that changed the sport of figure skating forever: She incorporated far more dance, more grace. And she was an unrivaled athlete, but also played like an entertainer to the audience and judges. Those innovations won Henie three consecutive Olympic gold medals and 10 back-to-back world championships, a record that still stands today. But Alison Haas, who curated a new exhibit on Henie at the Olympic museum in Lake Placid, says the skater also worked deliberately to make the sport sexier, more feminine. She points to a dress that Henie wore while skating in ice shows in the 1950s. 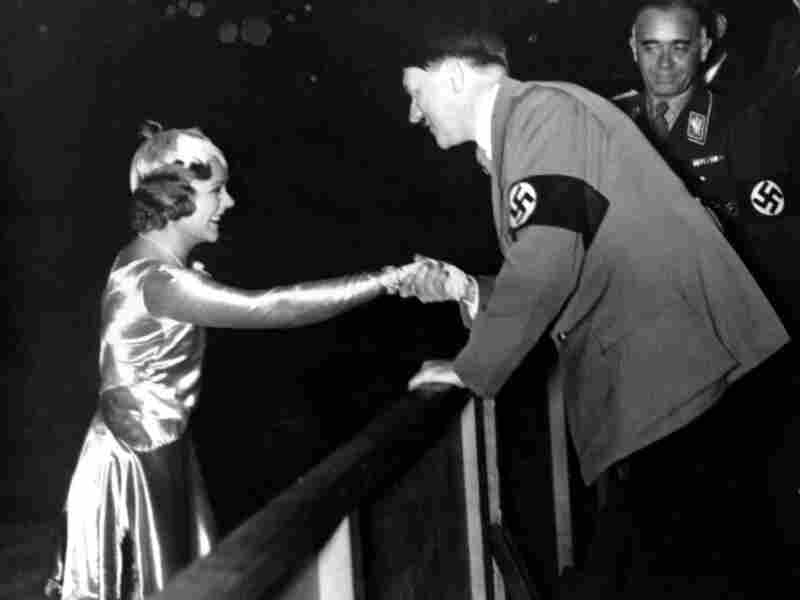 Adolf Hitler shakes hands with Sonja Henie following her exhibition in Berlin in 1934. "If we go around to the front of the dress, you'll really see how revealing it is with the plunging neckline down to her [belly button]," Haas says. It looks like something Beyonce might wear. This fierce instinct for self-promotion rocketed Henie to stardom, but it also got her in trouble. In the lead-up to the 1936 Winter Olympics in Germany, Henie was captured in newsreels flirting with Nazi officials and even with Adolf Hitler himself. One of her rivals, Swedish skater Vivi-Anne Hulten, was interviewed about the scandal for a documentary in the 1990s. "And there she went and gave a Hitler salute during the Olympic Games and shook hands with Hitler, and everybody said she became his girlfriend," Hulten said. That last bit — about a romance with Hitler — has been fiercely disputed, even discounted by many historians. But the rumors and the backlash were fierce. Still, Henie was so skillful at polishing her image that even during the build-up to World War II, she was able to recover and bounce back. She signed a deal in Hollywood with 20th Century Fox, and went on to make blockbuster films like Second Fiddle with Tyrone Power and Rudy Vallee. At her peak, she was No. 3 at the box office, behind Clark Gable and Shirley Temple. Haas says for a woman in the 1930s to translate a career in amateur sport into a media empire — with ice shows, film contracts and lines of merchandise — was unheard of. "I find it amazing that she just had this business sense to put a dollar sign behind that gold medal," says Haas, "to understand the commodity that she could become herself."